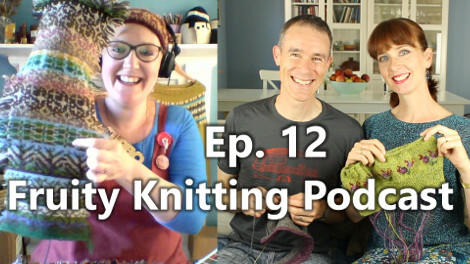 Felicity Ford, KNITSONIK in person, is our special guest in Episode 12. From fruitcake to stranded knitting, from Oxford University to the Shetlands, and from biscuit tins to brickwork, Felicity’s stories and observations of the world around us are to be savoured. 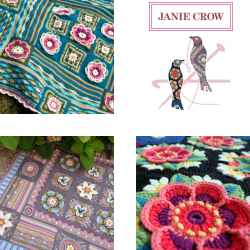 Jeni Reid joins us as our guest on Knitters of the World, and we have Blossom, Firebirds, the Jacket and more. 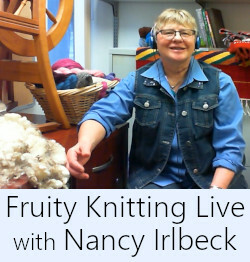 Felicity Ford combines her passion for wool with her fascination with sound to create KNITSONIK. Equipped with an Masters degree in Sonic Art and Composition from Oxford, and her faithful Edirol field recorder, Felicity has captured the sounds of the yarn world. The sheep, the farmers and their dogs, the birds from the forest or the coast, all brought to life through the medium of sound. 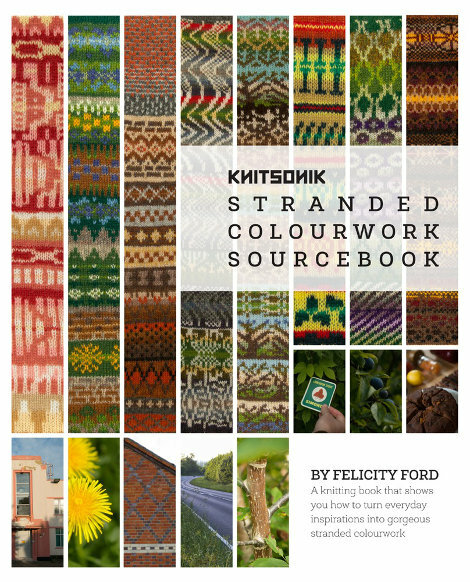 The KNITSONIK Stranded Colourwork Sourcebook is Felicity’s most recent project. Funded via a Kickstarter campaign and self-published with the support of brother Fergus as Photographer, Kate Davies as Editor, Jamieson & Smith as “Yarn Support”, and many more, the book is a beautifully presented guide to the interpretation of everyday objects in the medium of stranded knitting. 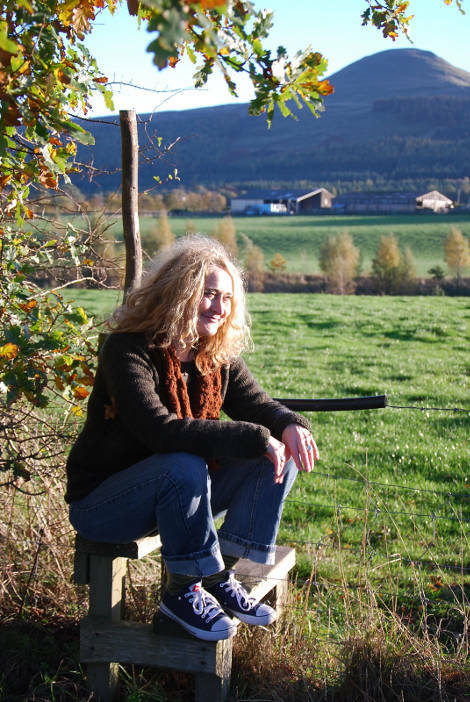 Felicity was Patron of the Shetland Wool Week in 2014 and continues to teach classes at this event. In 2015 her class was called “Quotidien Colourwork”, again showing her focus on everyday life. Felicity is also a lovely person. We hope you enjoy the interview as much as we did. 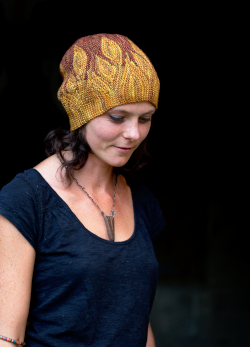 If you enjoyed this episode, then you will also enjoy Episode 14 featuring Donna Smith, Shetland designer, creator of the Baa-ble Hat, and patron of the Shetland Wool Week 2015. My fleece may be innocent but it comes from a breed I associate with dark deeds. Andrea has survived the first round of roses on her Blossom from Marie Wallin’s Springtime. There was some consternation and a little frogging, but the result is now good. Next challenge is the yoke, with more intarsia roses. 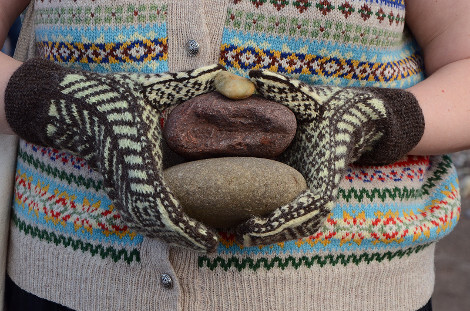 The Hiking Jacket is coming along, and I’m very happy with the combination of the Yorkshire Wildlife Trust Hebridean – Alpaka yarn, together with the Rowan Hemp Tweed. The Germans have a saying – “Der nächste Winter kommt bestimmt” – “The next winter will certainly come”. I would like to have the jacket ready for the coming winter, to enjoy wearing it on our wanderings in Germany and Wales. 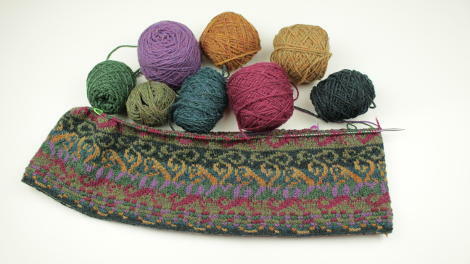 Andrea reports that she has completed 16 of a calculated 140 Firebirds for my next jumper. 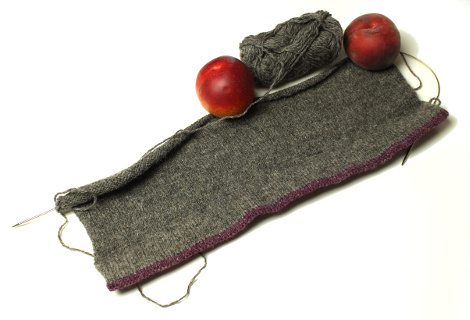 Andrea is using the Virtual Yarns Hebridean 2-ply as recommended in the pattern. Having made it this far, you can hear that I’m not really that quick at mental arithmetic. We prepare for the show, and I had seen some of those numbers before. But I do make a habit of trying to use my head before a calculator or Excel. And I look out for easy steps – like 19 by 29 being pretty much 20 x 29 (580, relatively easy), less 29, making 551. And even 20 x 30 would be a good approximation for figuring out how much Andrea loves me in Virtual Yarns 2 Ply. This pattern was released in 2008 in the Filati Magazine Edition 35, now out of print, so you will have to dig around. The pattern is simply called Number 27. It is knit in the Lana Grossa Cambio, which is 70% cotton and 30% polyamide. 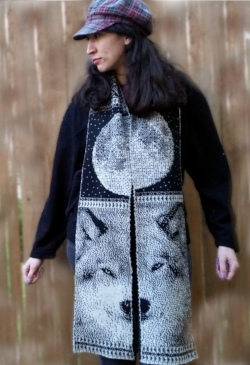 Andrea hasn’t even put her project up on Ravelry!! I absolutely love your podcasts. I woke up to a cold wet day in Perth Australia and I was so excited to see you had another podcast. 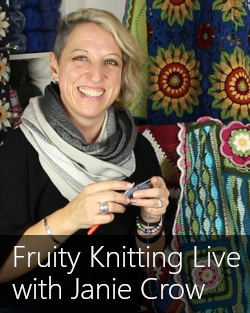 I love learning about the different knitting techniques and the way you combine them with a snapshot of the knitting world. Andrea I love all of your projects but how do you achieve so much.. In such a short time. I tried the method you use for stranded knitting and it is brilliant. I wish I,d known that several years ago when I knitted fairisle jumpers for New Zealand Ski resorts. Hi Betty. So great to hear that you’re watching from Perth. The format for the podcast, with some technique together with interesting people, is really just what Andrea would have like to watch herself. 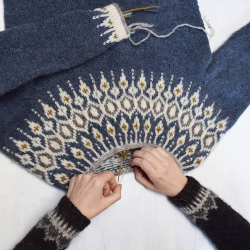 As far as how she gets so much done, she takes her knitting everywhere, and would do a row or two on a fairisle jumper with 8 balls of wool on a tram in the middle of summer. Thanks for watching! 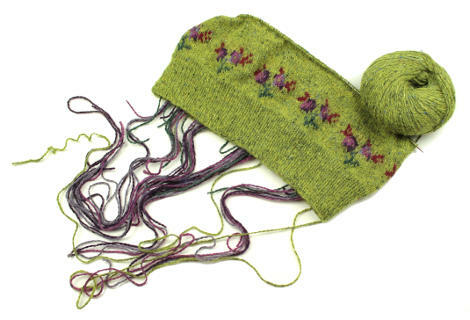 What yarn is Andrea using for the green Marie Wallin “bloom”?